Rice is the staple food in South India. Depending on their personal preferences, people may consume raw rice or par-boiled rice. Traditionally, rice is cooked in a narrow mouthed metal pot (வெண்கல பானை) with lot of water. 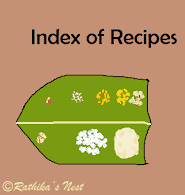 Once the rice is cooked well excess water is drained through a plate with holes (சிப்பல்). With the advent of pressure cooking, it is very easy to cook rice in 5-10 minutes. Learning to cook rice is the first lesson in South Indian cookery. Let us see how to cook raw rice. Method: Wash the rice well in a suitable vessel. Add the required quantity of water and place in a pressure cooker. After pressure builds up and the cooker starts to whistle, keep the fire on for 5 minutes, if your cooker whistles continuously or for 5 whistles if your cooker whistles intermittently. If you prefer the rice to be soft, you may pressure cook the rice for longer duration – 6 or 7 minutes/whistles.